This is my photo submission to the weekly Bird D’pot (Bird Digital Photography) meme hosted by Anni at I’D-Rather-B-Birdin’. On our second morning after returning home to South Florida, this Wood Stork appeared at the edge of our back lawn. We are only seeing adults, as there has been massive nesting failure over most of southeastern Florida, most notably at Corkscrew Swamp (See my blog about Struggling Storks as well as the updated information at the bottom of this page) . It was so close that I had trouble fitting the whole bird in the viewfinder. It stirred the water with its bright pink feet, to startle small fishes into its bill. …before flying off across the lake. 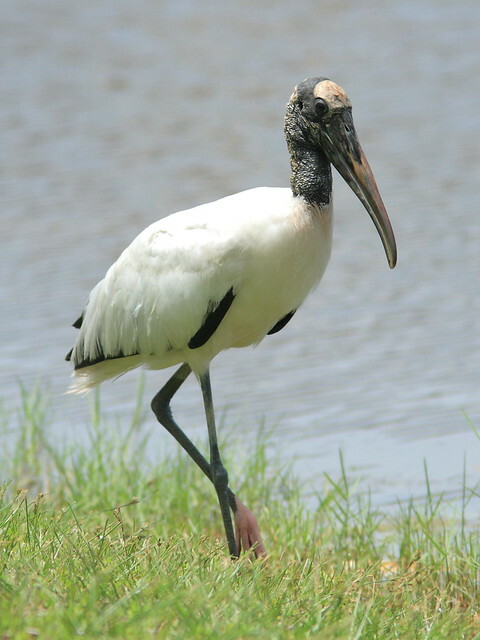 The Audubon Society provides this evidence-based overview of the Wood Stork’s precarious status in southern Florida over the last four decades, and the importance of privately-owned wet prairies to their survival. Although the number of Wood Stork nests outside of South Florida have increased from 1817 in the 1970s to 5491 in the 2000s, the number of nests in South Florida have not recovered, ranging from from 2406 to 2367 over the same period. Nationally the percentage of nests at Corkscrew Swamp declined from 34-37% to only 8% of the US total. There has been total nesting failure at Corkscrew since 2010. 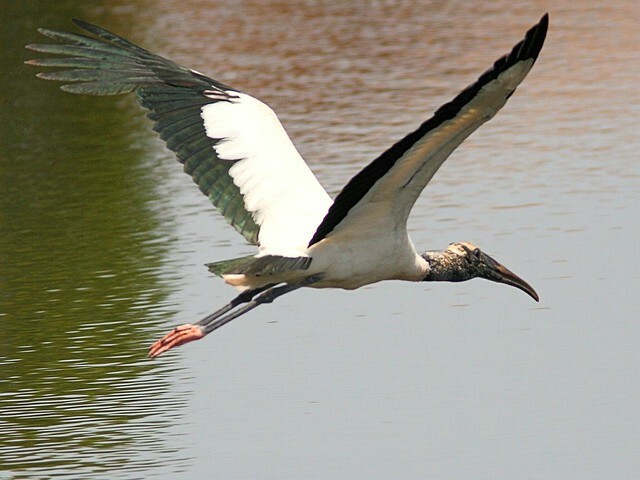 “Audubon has conducted a wood stork foraging study which documented foraging events over the course of two nesting seasons (2006-07 and 2008-09). Data analysis revealed that wet prairies are particularly important to wood storks early in the nesting season. Mapping of foraging locations revealed that 79% of the foraging occurred on private lands in the critical early months of the nesting season. 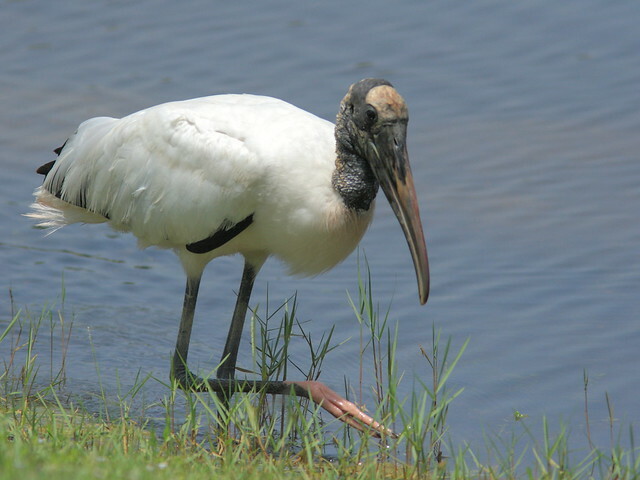 Supporting earlier nesting is critical to recovery efforts for wood stork. This suggests that conservation efforts must involve protecting the foraging values on private lands.” . In the meantime, the south Florida rookeries have continued in decline. For the past three years, Wood Storks failed to nest at all in the huge Corkscrew Swamp rookery. To date there has been no final action on the Proposed Rule. 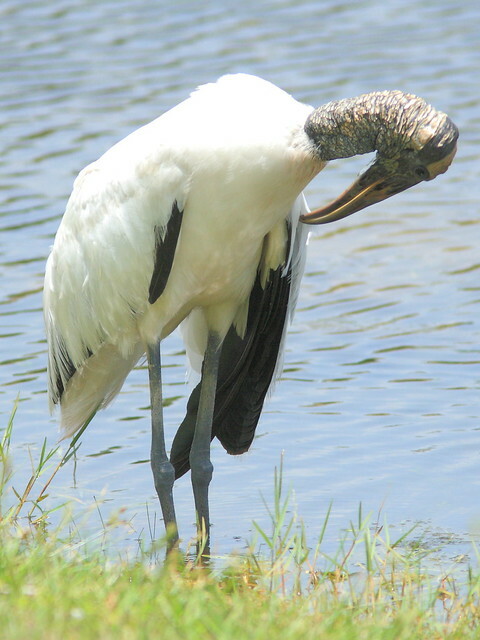 For the latest information, visit this USFWS Wood Stork web page. The content of the proposed rule contains much interesting information about the breeding biology of Wood Storks. The final rule may differ from the proposal, based upon comments and information received from the public. August 4th, 2012 at 8:49 am Love what you are doing. I think you might like to join http://birds.joy.net Best Regards. August 5th, 2012 at 6:03 am Good post! Great photos! August 5th, 2012 at 6:41 am The wood stork is a cool looking bird. You have some awesome shots, Ken! August 5th, 2012 at 7:10 am The decline of the everglades is a blot on the face of Florida!! Great post. Boom & Gary of the Vermilon River, Canada. August 5th, 2012 at 7:59 am Wonderful shots! August 5th, 2012 at 7:59 am such wonderful, prehistoric looking birds! i was fortunate to have one stop here at our pond in texas one winter! August 5th, 2012 at 12:11 pm Incredible. I saw one for the very first time a few weeks back, and I was just amazed at their size and agility!!! Awesome images. Thanks for linking up at the Bird D’Pot!! August 6th, 2012 at 3:19 am I wonder what natural evolution made it´s head look like that? It´s a gorgeous bird, I saw it in CostaRica. Very nice when flying. August 6th, 2012 at 5:05 pm Awesome shots of the endangered Wood Stork Ken. The in flight photo is super ans I love those pink feet. I hope I get to see one before they are all gone so developers can build more homes. This seems to be the same plight of the Western Burrowing Owl and I hear that the owls in Florida are not doing so well now either. Thank you for bringing the story of this bird’s perilous journey to our attention. August 8th, 2012 at 1:44 pm Great shots of an awesome bird.